April 6, 2007: Sunny and cold, water temp 56* and clear. After a major cold front blew through yesterday dropping the daytime temperatures 30 * I decided to get on the water at 4 this morning to hunt down some bait. I thought the front would push the bait out off the flats and out to the first breaks and thats where I concentrated my efforts. I threw about 30 times and caught about 65 baits. Picked my clients up at their dock and put out my spread of 10 boards, a bobber and a down line . I started my first pull also on the first breaks off the edges of the flats and just as soon as I got them out the action began. 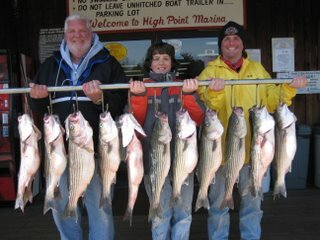 Bill and Dylon alternated reeling in fish for the next 2 hours until we broke a nice one off at the boat . It alerted the rest of the school so we had to relocate to another flat. As soon as we hit it the drill was on again. 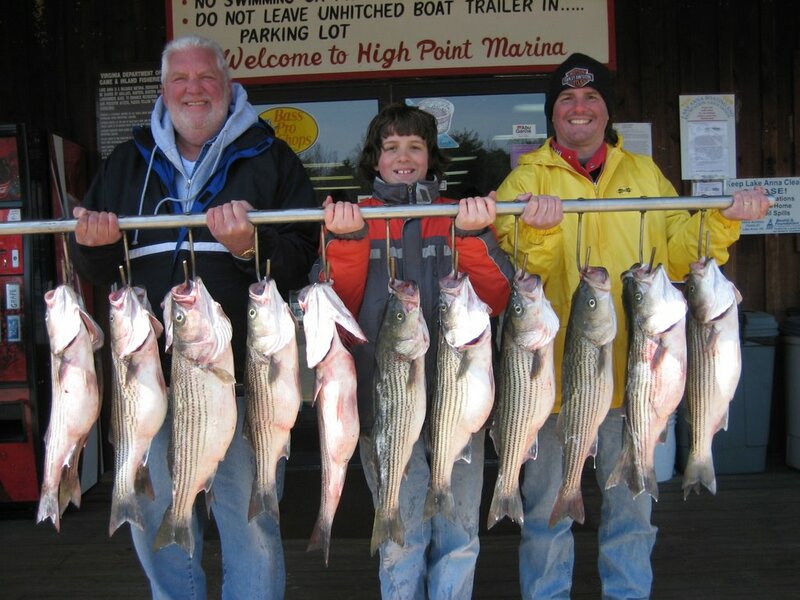 A shart breeze got up and slowed fishing a little but by noon we had 47 strikes and boated 21 Stripers, clients keeping 16 fish with a total weight of 100 pounds.